CYPRUS MORRIS was formed in 2008 as a result of a chance meeting of 3 British residents in Cyprus who had been morris dancers in the UK; conversation naturally turned to the possibility of starting a side in Cyprus, and within a few months the inaugural meeting of Cyprus Morris took place. From a nucleus of 6 members, we have now grown to a membership of over 20. 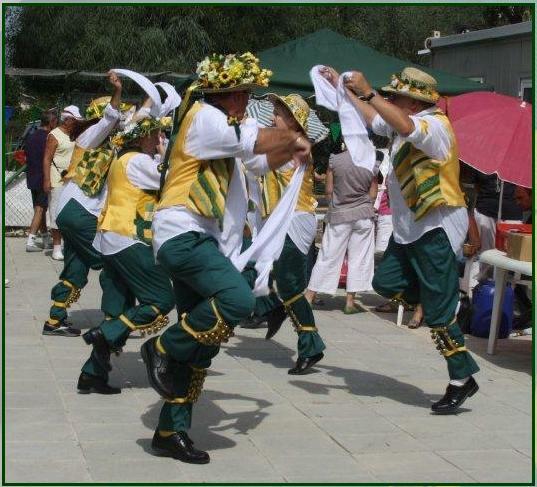 Cyprus Morris, with its green,white and gold kit reflecting the colours of the Cyprus flag, has become a familiar sight at fetes, festivals and other events across the island. In 2010 Cyprus Morris hosted a visit to Cyprus by Jockey Morris from Birmingham, UK, and in 2015 we were delighted to welcome Manchester Morris Men as our guests. Click HERE for pictures and information about the visit. In 2017 we were pleased to be hosted by Manchester and to represent Cyprus at the Buxton Festival. We meet on Mondays at the village hall in Kyvides, a little to the north-west of Limassol. See the "Contact " page for directions. New members - dancers or musicians, experienced or raw beginners - are always welcome. If you don't want to dance or play but would still like to support Cyprus Morris, we have an Associate Member scheme which may interest you. Please see the Contact page for details.